Pets: Dogs must be on a leash. Heading to the tram? Surprisingly the trail part of the 4T although going through in the middle of Portland goes mostly through quiet scenic woods away from dwellings and traffic. 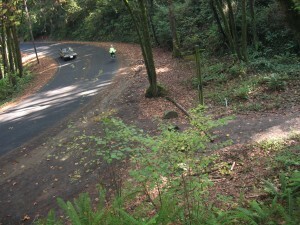 The trail goes up to Council Crest where you will have great views before descending to the zoo. You have a choice of routes. The following map shows the Urban Route; a map for the Forest Route is a ways below. 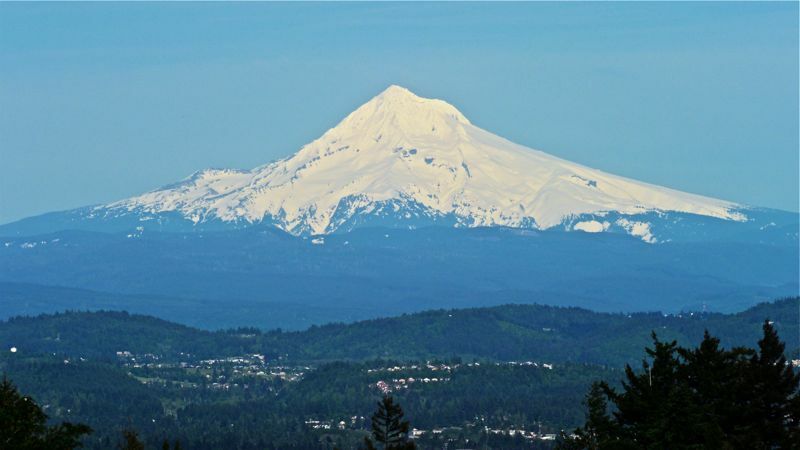 The hike covers either 3.5 or 4.1 miles, and takes between an two and three hours, depending on if you take the Urban Route or the Forest Trail. Be prepared to climb between 500 feet (urban route) and 800 feet (forest route). Much of the hike is on trails through the woods which can be muddy in wet weather. Water isn’t available on this trail, although a new “portapotty” has been added at Council Crest Park. A part of the trail is along the shoulder of roads and although these roads are not heavily traveled, some parents with small children have been concerned. See the interpretive map and trail information at the east end of AuCoin Plaza where the elevators are located. Restrooms are available at the east end of the plaza. From the east end of the MAX station, turn downhill towards the Oregon Zoo and walking away from the World Forestry Center. Follow the sidewalk along the front of the Les AuCoin Plaza, cross the street and turn right to walk in front of the Oregon Zoo. 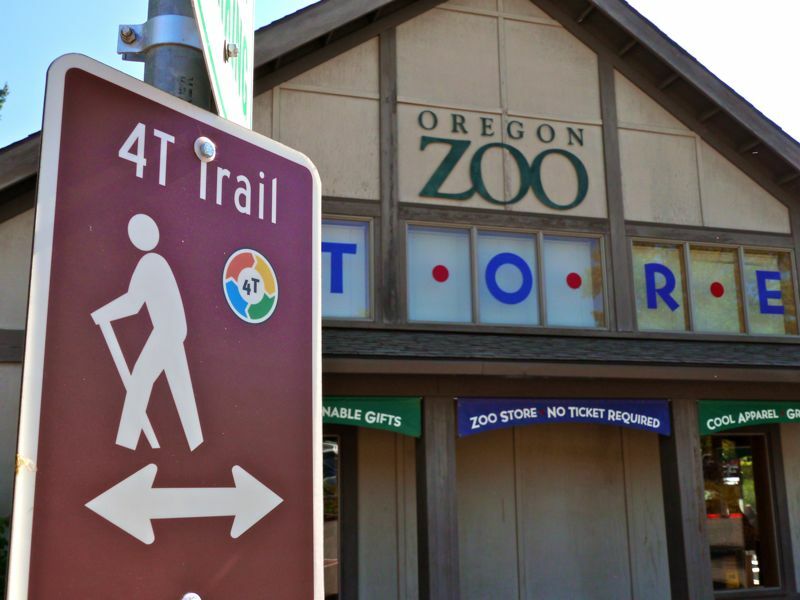 You can also eat at the Oregon Zoo restaurant or visit the restroom just inside the gate near the restaurant without paying the entry fee for the zoo. Follow the brown 4T Trail signs on a curving downhill sidewalk which crosses several streets and freeway exits. Be careful as you cross to be sure the vehicle drivers see you and stop. You will come to a bridge over Highway 26, cross it. At the far side of Highway 26, turn left and walk about 200 yards along the highway on-ramp to a signed trail ascending the hill to the right. The 4T signs in Parks are green, while the 4T signs on streets are larger and are brown. In come cases, the 4T follows the same route as SWTrails Urban Trail 7, 1, and 6. 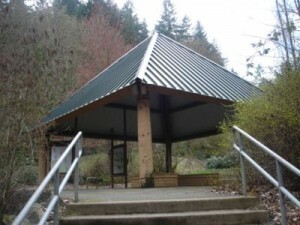 The same route is also used by the Marquam Trail and Portland’s 40 mile loop. Follow this scenic trail a half mile up the hillside until you emerge on SW Patton Road. Turn right on Patton. 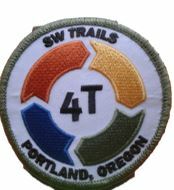 On Portland streets, watch for the brown Trail 7 signs with the 4T logo, and for brown 4T Trail signs, when the 4T leaves Urban Trail Routes. At the intersection of Humphrey, Patton, and Talbot, turn left go uphill on Talbot. 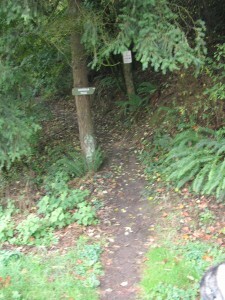 Follow it to an entrance to the Marquam Trail in Council Crest Park where green 4T signs lead you. Follow the paved path to a street near the top, and then take a sharp left to a sidewalk on the left that brings you around the top of Council Crest. 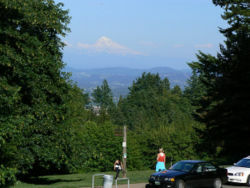 On a clear day from Council Crest you can see Mt. Hood in one direction, Mt. St. Helens in another (with Mt. Rainer peeking over the edge of Mt. 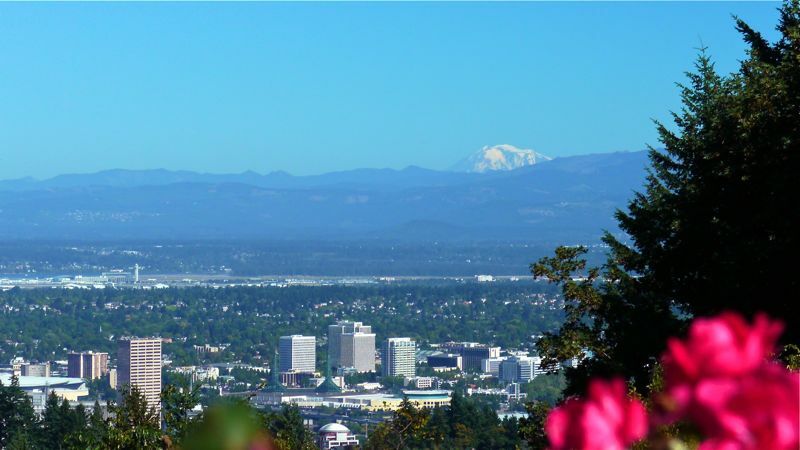 St. Helens), and Mt. Adams in a third direction. Mt. Hood as seen from Council Crest on the 4T. Mt. 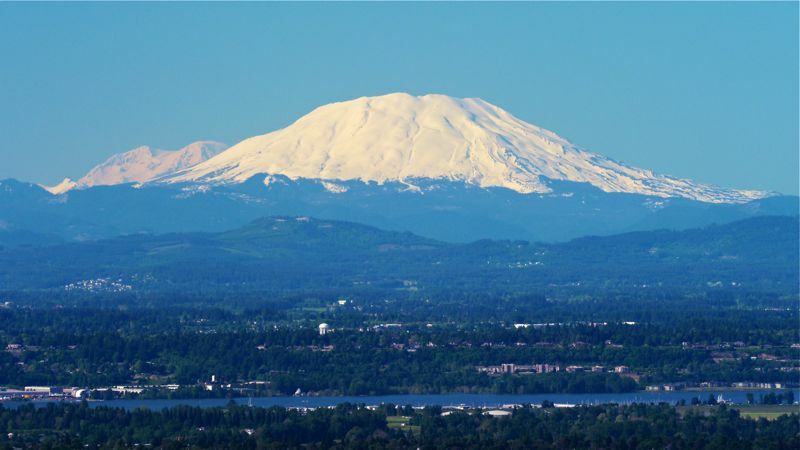 St. Helens with Mt. Rainer on its left flank. Mt. Adams beyond downtown Portland as seen from Council Crest on the 4T. The 4T continues just below the interpretive sign situated on the east side of the road that circles Council Crest. Make sure to wear appropriate shoes for hiking, as rain and other inclement weather can leave the trail muddy and hard to walk. From the interpretive sign on the east side of the crest, take the steps downhill and follow the green 4T signs down along the side of the hill until you reach Fairmont Boulevard. At the trail’s intersection with Fairmount Boulevard, you have a choice of routes to get to 9th and Gibbs. 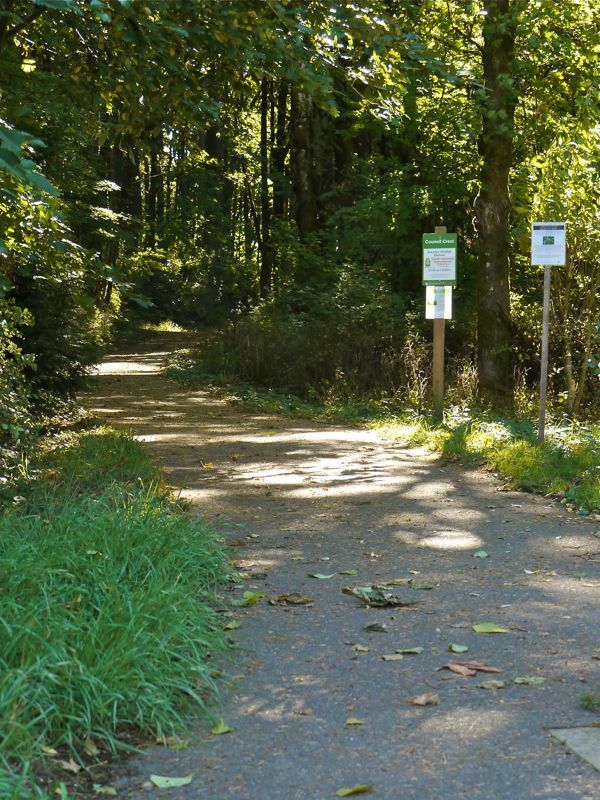 Walk the Forest Trail through Marquam Nature Park or take the Urban Shortcut on paved residential streets. 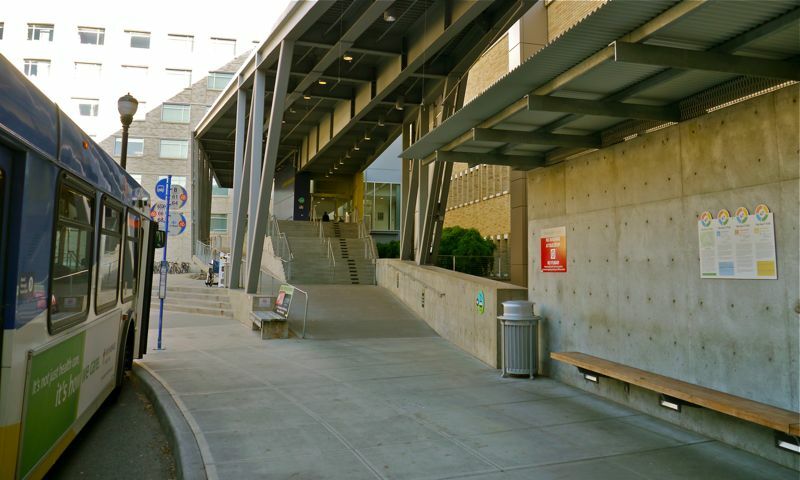 Both routes eventually take you to the upper Tram Station at the Oregon Health and Sciences University (OHSU). To use the “Forest Trail” cross the street and follow path; for “Urban Route” turn right and follow Fairmount Blvd. Cross the street onto the wooded path leading downhill. 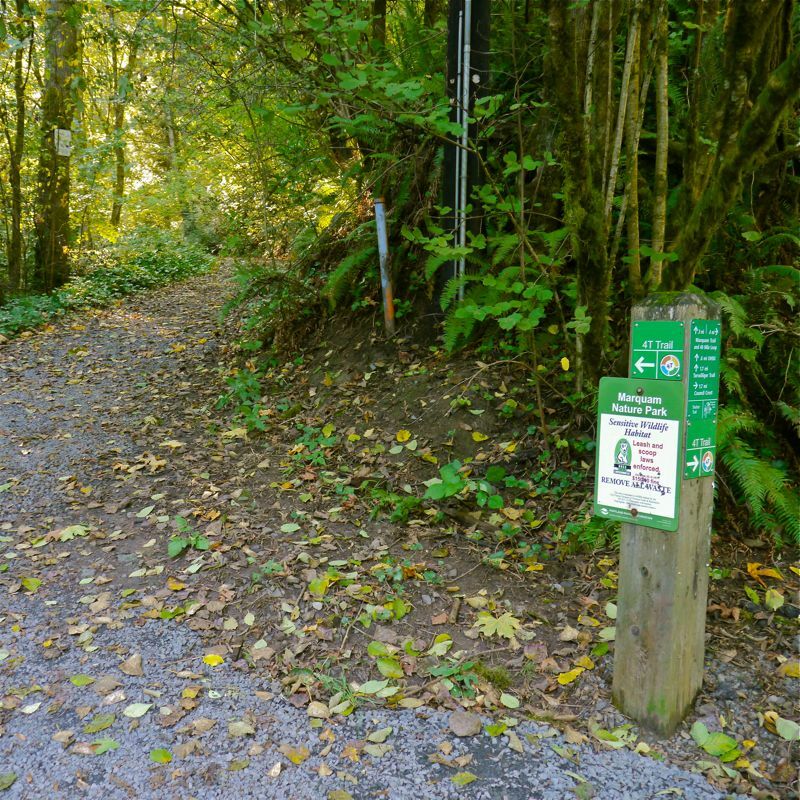 This Forest Trail (aka Marquam Trail) takes you through Marquam Nature Park crossing SW Sherwood and continues down a forested canyon to the Marquam Shelter just off SW Sam Jackson Parkway. 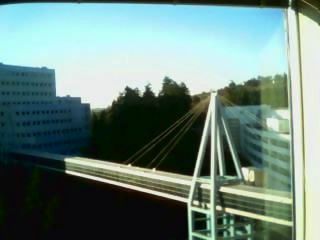 From there one must climb up 300 feet to the OHSU. Facing downhill at the drinking fountain next to the interpretive shelter, look to your right to see the base of a wide trail, that used to be a road, ascending a narrow ravine. Proceed up this trail for about 100 yards and look for a side trail that climbs up on your left. This is the Connor Trail that will take you up to SW Gibbs, near OHSU. As you begin to get just below the looming medical buildings about 3/8 of a mile up the trail, watch for an unusually large “burl” perched on a short tree trunk just below the trial. At the top of the steep slope you will emerge on to SW 9th Street. Proceed south to the intersection of SW 9th and SW Gibbs. At this juncture the Forest Route rejoins the Urban Route. The urban route is less scenic, shorter and does not involve any more climbs. [Distance: 2.2 miles, 700 feet down, 300 feet up. Takes approximately an hour and 45 minutes]. It follows local neighborhood streets that have no sidewalks. Wherever possible walk facing traffic. 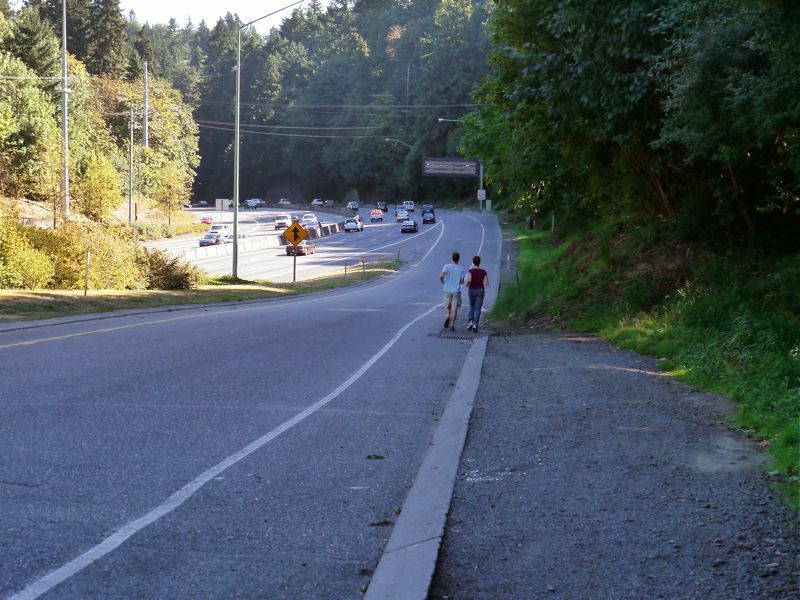 When you reach SW Marquam Hill Road turn left and follow this curving road downhill using the unimproved shoulders and walking on the side that provides greater visibility for on-coming cars. Along the way you will pass further trail entrances that descend into the Marquam Park. But we will continue to follow the Marquam Hill Road which turns into SW Gibbs as it enters the residential area immediately above the hospital. 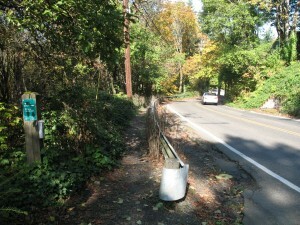 The entire route is 1.6 miles (drops 400 feet in elevation) in length to reach 9th & SW Gibbs – where both routes rejoin. At the intersection of SW Gibbs and SW 9th proceed downhill towards the hospital (keep straight if coming along the “urban” route, or turn left if coming along the “forest” trail). SW Gibbs becomes Sam Jackson Parkway as it enters the hospital complex. Proceed downhill towards OHSU and cross to the south side of Sam Jackson Parkway. 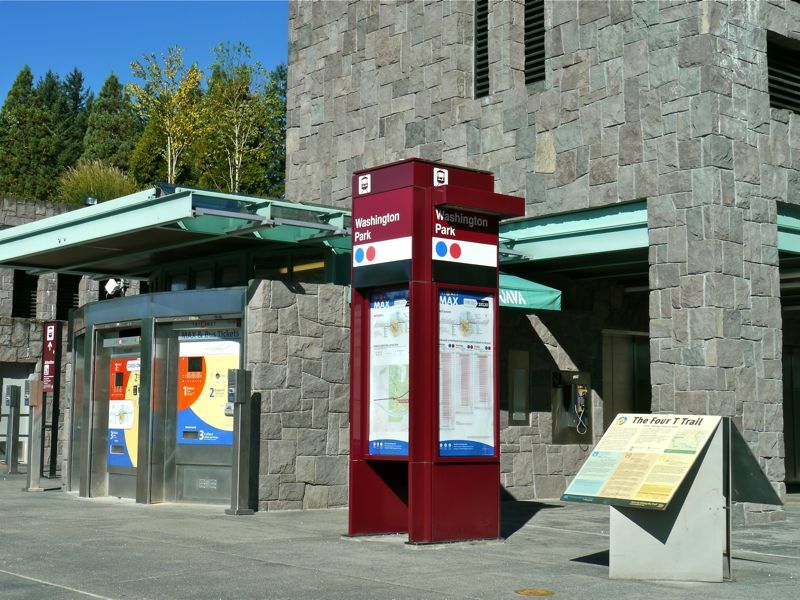 Continue down the hill past the Emergency Entrance to the OHSU hospital, past the bus stop and the 4T interpretive sign. As you proceed under the second pedestrian bridge note the broad flight of stairs entering the hospital complex. Take these stairs to enter the building and follow the signs through the building to the Tram entrance. Stop for a cup of coffee at the coffee station just inside the building. Seniors get a special price! 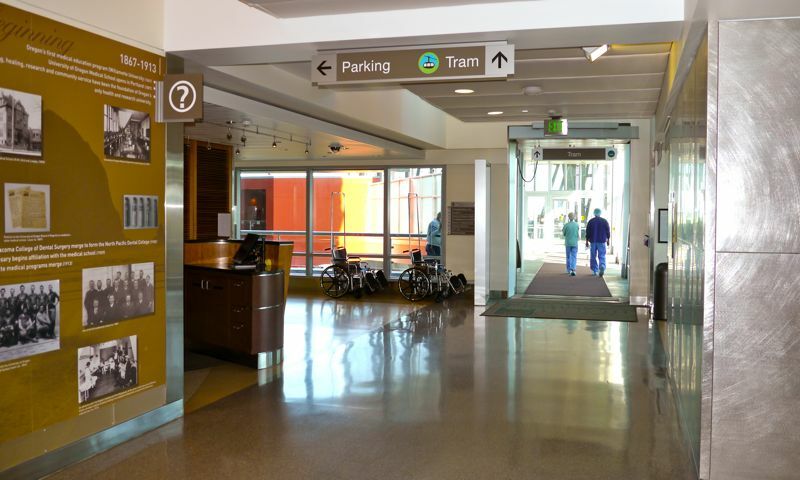 Before you take the tram, you might want a side trip to view the spectacular pedestrian skybridge between OHSU and the VA. At 660 feet long it is the longest pedestrian suspended bridge in America. The next leg of the 4T is the tram.